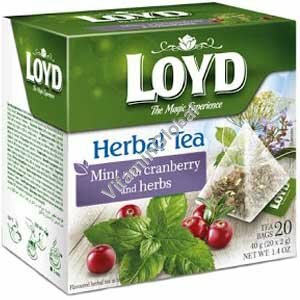 Loyd’s mint with cranderry and herbs tea charm wonderful aroma and subtle flavor. Ingredients: mint (37.5), rosehip, apple, flavourings, liqourice root 5%, flavourings, sweet blackberry leaf (5%), fennel (3%), anise (1.5%), sage (1%), cranberry (0.5%). Contains liqourice - people suffering from hypertension should avoid excessive consumption. Brewing instructions: Place one tea bag of Loyd chamomile tea in a cup and add boiling water. Let steep for 5 minutes. Add sweetener if desired. Kosher under the Rabbinical Supervision of Hug Hatam Sofer. Storage: storage in a dry and cool place in tightly closed original package.